While Gordon revels in his new found power, Fish looks for a way to escape her island prison. Gotham may have been off the air for around a month, but it’s still managed to return with the same problems that have made this season a chore to watch at times. There remains a frustrating mix of interesting and lackluster storylines, something which I’d hoped to fade as we got later into the season. There’s only a few episodes left in Season 1, so maybe they’ll tie everything together to set up the next season, but it’s looking unlikely at this stage. On the good side of things, Gordon’s material was quite strong this week. It was funny to see him walking around with his head held high, clearly on a high after getting one over on Loeb. Things were a little bit too cheery, though, so I was happy that we got the delightful twist that Loeb was trying to set a ruthless killer on Gordon and his loved ones. Gordon confronting Loeb in front of his fellow cops and basically declaring war on him was another good moment. Loeb can act as Gordon’s big bad for the rest of the season, something he hasn’t really had so far despite a boatload of villains appearing on the show in the last 18 episodes or so. 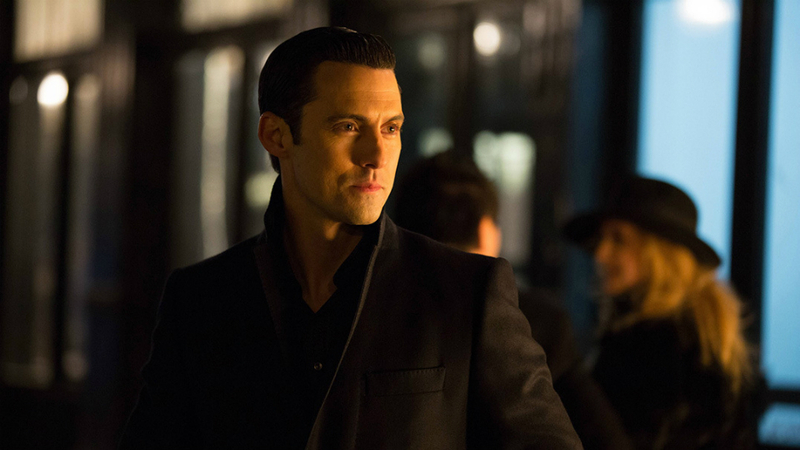 The Ogre (Milo Ventimiglia), Gotham City’s latest menace, was a suitably creepy villain. The flashbacks to his time spent with his latest victim were quite well done, and they proved that the normal looking guys can be the most dangerous. Things were kept rather tame, but the Ogre’s M.O. of forcing his victims to live with him until killing them was all kinds of twisted. My big worry here is that they’ll go down the highly signposted route of Leslie becoming his next target. It seems to be way too obvious to happen considering the epic amount of foreshadowing we got here, but I wouldn’t rule anything out on Gotham. It was pointed out that Leslie was the same age, had the same look and lived in the same area as the latest victim. I really hope that she was just doing some laundry when Gordon couldn’t contact her at the end of the episode. Penguin’s plotting has gotten less interesting since the midway point of the season, but at least it appears like he’s gearing up to kill Maroni. He set that plan in motion by chopping off a few fingers and acquiring one of Maroni’s favorite establishments. We’ll see how this all plays out. Bruce and Selina got up to a few detective hijinks, and I was actually surprised to see how this all played out. I figured that Alfred would be the one to confront Reggie, but Bruce managed to track him down with Selina’s help. It turns out that Reggie’s bum act was a front. He coughed up the names of the Wayne board members who had sent him to spy on Bruce, and then promptly found himself getting pushed out a window by Selina. It was a nice twist in the story, and I especially liked that Bruce himself considered pushing Reggie. Fish’s side of things continues to disappoint at almost every turn. I liked her original arc of trying to take down Falcone, but she’s gotten hard to watch ever since her plan failed so miserably. Her escape from the Dollmaker’s island played out predictably, with the only surprise being that she got shot. I don’t think that’ll lead to anything significant however, unless she turns to an actual interesting character to save her life. It seems inevitable that she’ll return to Gotham with a ragtag gang or random extras and try and claim her power back. Let’s just hope that turns out to be more interesting than the last few episodes of island chicanery. I feel like I’ve said this at least a half a dozen times at this stage, but Gotham remains a decent show that would benefit from trimming the fat to concentrate on the things it has going for it. Fish hasn’t been interesting to watch recently, but that might change now that she has escaped. The Gordon and Loeb material is where the show is strongest at the moment, and when you mix that in with a new killer, Penguin’s plots and Bruce’s investigation, the final episodes of the season have a chance of being quite good. What’s next for Fish? Are you interested in her quest to reclaim the power she has lost or have you lost interest entirely? Discuss with me @OldSnake24. Also, be sure to follow us @YouNerded!